What I really really wanted was some PJs for Aaron and I had no trouble choosing. He'd recently gone through a growth spurt (and actually has again) so all of his PJs were short on the arms and legs. When he has GREAT PJs I enjoy bedtime more as I love dressing him for bed when I know he looks great. Is it just me? At the time of choosing (back in February) they had a blue cross sale on, so the Pac Man ones and the Monster ones were heavily reduced so were bargains and sadly dear reader, that means they are no longer available. Actually I tell a lie, I just checked and the Pac Man ones are available in age 9-10. 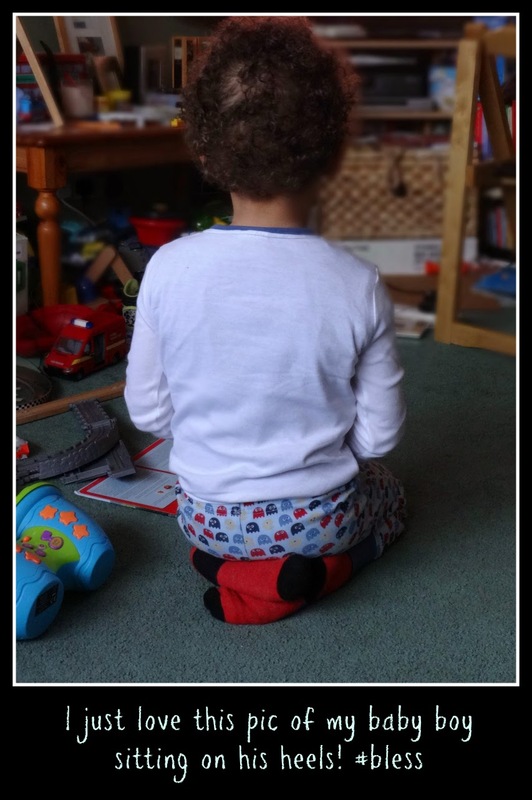 Despite Aaron being age 3 he has been in age 5-6 for ages as he is incredibly tall and has been since birth. They fit just right, and are beautiful fabric. We've washed them quite a few times and they're as good as new. What I LOVE about the Pac Man ones is that they are "skinny" which means they are such a gorgeous snug fit. The brand is Mini Vanilla and you can feel immediately that they are QUALITY! Aaron's going through a massive Pac Man phase at the moment and watches it all the time on You Tube and there is even a show on TV (which is what got him into it) - did you know it's made a comeback? It's on the Disney XD channel. He has no idea it is a computer game - nor does he know that me and my Mum had the hand held game when I was little (in the 80s) and that we both "clocked it". Mum never touched any of my handheld games (I had 8! I was a spoilt only child) but she was off sick with salmonella in bed for a week and turned out to be a Pac Man fan! Who knew! We (Aaron and I) now have the Pac Man characters (figurines) but THAT is a review that I am yet to right - coming to a blog near you soon! I love that the Pac Mans on the bottoms are not just stickers so they wash well and I love that the one on the top is embroidered on, and again not just a sticker! 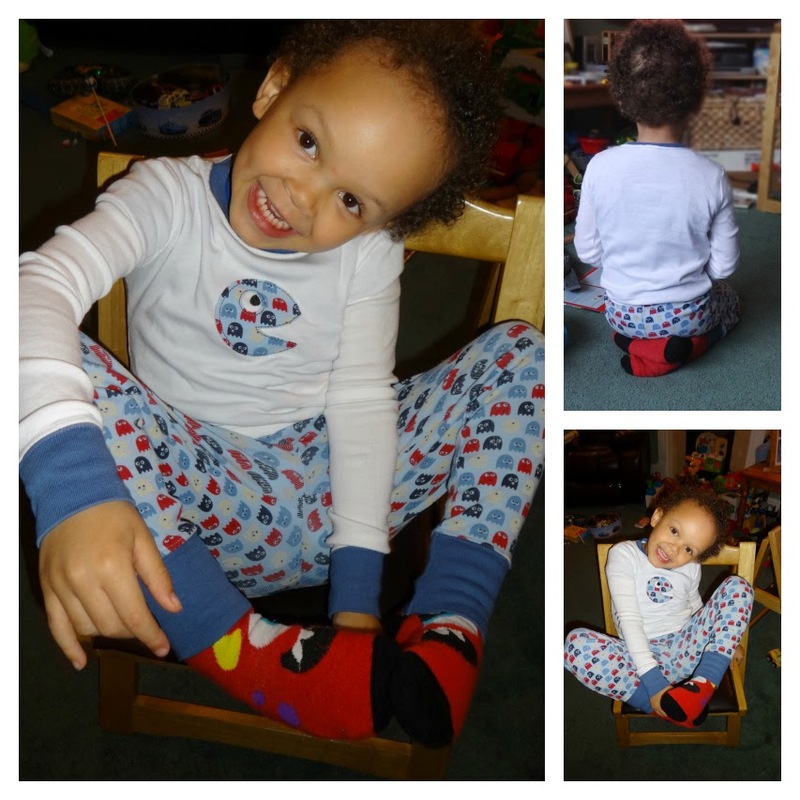 The other thing I adore about these PJs is the cuffs on the arms and ankles, as it is still chilly at night despite the Spring weather and it's great to know Aaron doesn't have any chills getting under baggy PJs. You can see in the photo that they are not at all skimpy in length, even more so on the arms, so he will 100% get 6-12 months out of them, and more if his growth plateaus for a while which it would need to with the height of him right now! 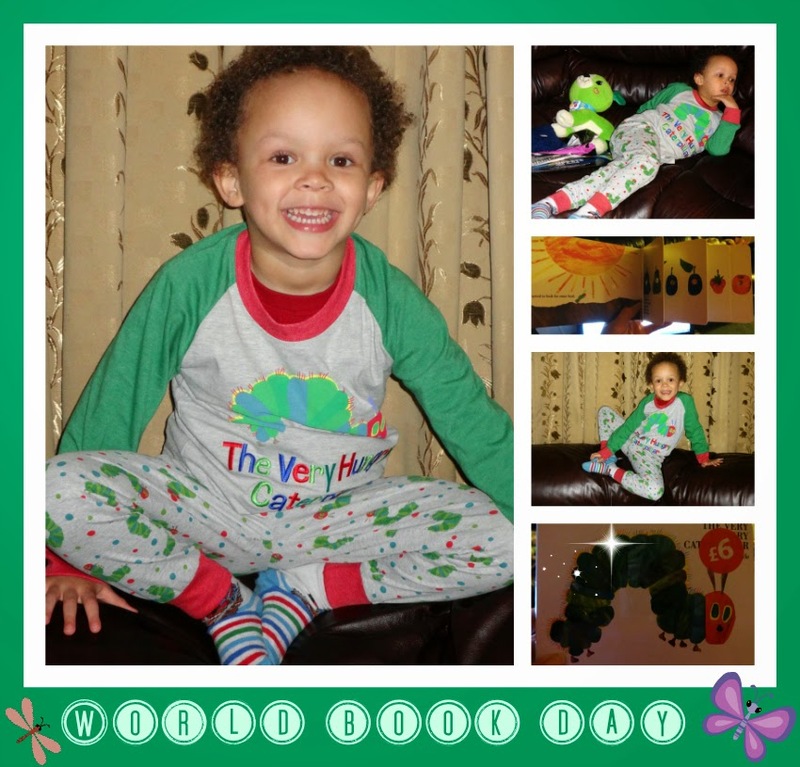 I already blogged previously about the Very Hungry Caterpillar PJs as he wore them for World Book Day. They too are QUALITY and have the same principle of cuffs on arms and legs, which I now think are a must in cooler weather. Again no nasty stickers like you see at the cheaper end of the market. I have very much enjoyed my exploration of the top end of PJs. Sometimes you know, you DO get what you pay for. The Very Hungry Caterpillar PJs retail at 22 pounds. I'd say they make a perfect birthday or Christmas present for the little book fan. You won't regret it as the fit and quality are both superb. The colours are really vibrant and I just love Aaron in them. The brand this time is Fabric Flavours and as a really nice touch the swing tag is made of fabric. I couldn't throw it away as I just loved it! I am sure you can tell that this is a review I have very much enjoyed. You will know from my blog that I don't go to the opening of a postage stamp (in terms of blogging events) not that I have ever been invited to such an event ;-) and similarly I don't review just anything. If it's not right for Aaron and/or me, it aint getting on the blog #simples. Blogging is a dedicated and time consuming affair, hence why I will only do a review if it is something that I want, that I really really want. On this occasion it was PJs as we had a real shortage and the budget wasn't allowing for the PJ splurge that I knew I wanted to have. So thank you thank you thank you House of Fraser. Their website is really worth checking out. Especially the kids and baby section. Disclosure: I was provided with my (Aaron's) precious PJs free of charge but was not told what to say. When I love it I tell you about it! Them's the breaks! These look great! 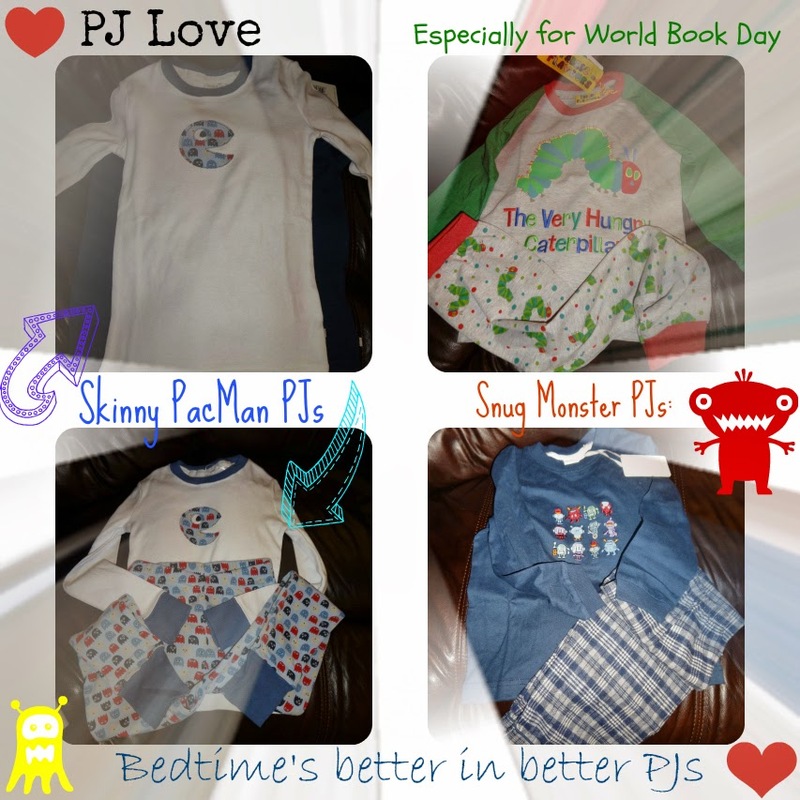 I love soft, well made pjs for bedtime!